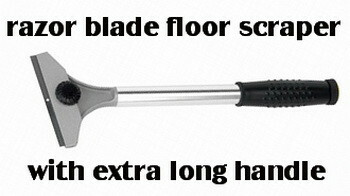 Purchase a large long handle razor blade scraper. They are the size of a broom but at one end is a large sharp razor blade. Remove the carpet glue by scraping it using some good old elbow grease. These scrapers easily remove huge chunks of the glue. Hot water will make the glue come to a softer state. Simply boil some water and pour it carefully over the carpet glue in sections. Let the hot water penetrate for about 2 minutes. The heat will soften the glue and as it is doing so, scrape it off using your handy razor blade scraper. If the 2 best methods above worked but you still have residue leftover from the glue, use a heavy duty scrubber brush on a pole to scrub the rest. Mix one gallon of boiling water with 2 cups of ammonia and a few big drops of Dawn liquid detergent in a 5 gallon bucket. Dip the scrubber brush into the mixture and scrub the concrete vigorously. Hose off or mop the area well when finished using this method. An adhesive remover will chemically softens the glue to make it easier to scrape. Apply the adhesive remover on the concrete floor following the instructions on the box. Use the razor scraper to remove the glue once it is soft. Just a small area of concrete to remove the glue? 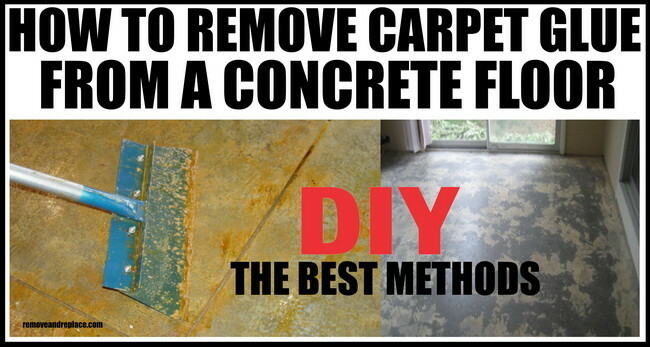 Use the Ironing method..
Cover the glue on the concrete with newspapers. Turn on the iron and glide it over the newspapers. This should make the glue soft and easy to scrape up. You may need to do this many times until all of the glue is removed. When the above methods are just not enough, consider renting a concrete grinder or a demolition hammer with the proper attachments at your local home improvement store. These professional power tools can make the job faster but will cost you more money so weigh out the options when choosing your best glue removal method. Previous post: 30 Christmas Tree Ornaments For Kids DIY Crafts FUN!